This is a summary for Brinley’s 40th week; she was 39 weeks old. Brinley turned 9 months old this week! 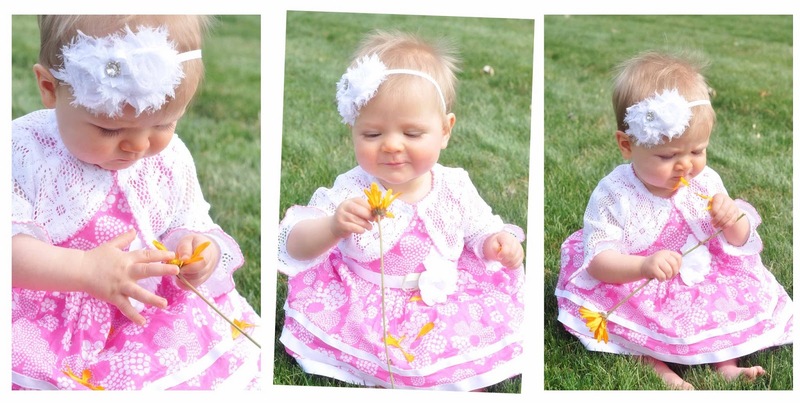 I got this idea…this idea that it would be super cute to do a picture with her holding a flower. She isn’t the type of baby that puts everything in her mouth, so I wasn’t so worried about that. Welll…she put this in her mouth! It shouldn’t be surprising. Note to self–fake flowers. She took a bottle from her dad this week! That was an exciting step! It was nice because I was able to take Kaitlyn and McKenna to our local civic ballet to see Cinderella. If Brinley wouldn’t do bottle, I wouldn’t have been able to take them. This week, I gave her grapes. They were a little bitter, and she was not too impressed. I bought some more later in the week and they were much sweeter and she had more interest in those. I didn’t puree them; I just cut them up and gave them to her. Sleeping is good and the same. This week, she started rocking on her knees. She is still doing the walrus crawl, but she gets on her knees sometimes. Kaitlyn and McKenna had their dance recital this week. We had to get Brinley up from her afternoon nap about 1.5 hours earl for it (she was super confused). She made it through their dances, but then she got super upset toward the end. In the beginning, she loved it. She loved watching the dancing. Brinley had her 9 month well-check visit this week. She is doing great! She jumped significantly in her height. I figured she had because she seemed so much bigger to me. She grew three inches in three months and jumped about 30-40% on her growth curve. She also jumped about the same percentage on her head size. Her weight it about the same–I can’t remember if it went up a few percent or down a few percent. It is common for breastfed babies to thin out at this age–especially if they are crawling or walking. My son is 24 weeks today. I have read your blog extensively and read many posts multiple times. Thank you so much for all you do! This site is filled with wonderful information.Here is my question. I don't have "supply" issues, per se, but as my lactation consultant explained it to me, I have storage/let down issues. Many feedings I am only producing 1.5 oz. Because of this, my son still eats 8 times per day. We are on a combo 2.5/3hr schedule with him going no more than 4 hours between feedings at night. I do not wake him to feed in the night, as I am always hopeful that he will eventually sleep through. The longest he ever has gone is 5 hours but that has only happened twice and not recently. Both my dr. and consultant have assured me that he still needs these feedings. My issue is that I never am able to get a consistent wake time for the day. He's all over the map and I am then confused as to when his bedtime should be. I would love for his DWT to be 7:30, but if he wakes hungry at 6:30 and can not be put off I am at a loss as to what to do. For example, today he woke at 6:50 bright eyed and bushy tailed after sleeping an almost 4 hr stretch. yesterday it was 8:00 because he was hungry at 5:45 but went right back to sleep. It was 6:50 the day before that. I have read all your posts on early wakings and establishing schedules, but I feel like I must be missing something. I know my situation is a bit different because of my nursing issues, but I so want to be able to establish a somewhat set waketime and bedtime. As bad as this sounds, it is much better than it was even a month ago when he was waking 4-6 times a night to eat. The improvement I believe is due to my working diligently on increasing my milk supply.Also, his current waketimes between naps are around 1-1.5 hours (increasing from 1 as the day progresses). I tried dropping the 4th nap, but he doesn't seem quite ready. We started solids this past Friday but have seen no improvement as of yet. Thank you so much for any input you can give! Brinley's headband (and Brinley) is so cute! Did you make it or buy it? I would love to know how to make it or where you bought it! Thanks! I am in the exact same camp as Diana above! I have tried everything to get her to sleep later in the am but nothing works. She seems like she is hungry when she wakes up. Sometimes she will wake up around 5 am and nurse and sleep until about 7. If she wakes in the 6:00 hour she won't go back to sleep. I would love her to be on a 7:30am-7:30 on schedule but I can't get it to work. Any suggestions? Following as we have the same issue right now as Diana too.